According to the International Panel on Climate Change, while majority of the efforts to combat climate change have been centred on mitigation, climate change adaptation is becoming crucial for effective and efficient climate change strategies. This is demonstrated by the growing importance of concepts like vulnerability, adaptive capacity and resilience of socioecological systems in the international political agenda. Along these lines, several of the climate change initiatives developed in the Basque Country express the need to develop climate change adaptation plans from a proactive and anticipatory perspective in order to minimize the impacts on ecosystems, human health and wellbeing, regional economy and infrastructures. Despite the competitive advantages and economic benefits which can be provided by the implementation of climate change adaptation strategies, many governments have not yet included such measures in their policies and plans. In this regard, the project PACC-Vitoria (Climate Change Adaptation Plan of Vitoria-Gasteiz) was formalized and launched in mid-2010 through a collaboration agreement between the Basque Government, the City Council of Vitoria-Gasteiz and the Unit of Environment of Tecnalia (research centre located in Bilbao, Spain). Basque Government. (2008). Basque plan to combat climate change - Plan Vasco de Lucha contra el Cambio Climático (PVLCC) 2008–2012. In IHOBE Sociedad Pública de Gestión Medioambiental (Ed. ), Basque Government – Gobierno Vasco. http://www.ingurumena.ejgv.euskadi.net/r49-11293/es/contenidos/plan_programa_proyecto/plan_cambio_climatico/es_cc/adjuntos/pvlcc.pdf. Accessed 15 June 2011. DEFRA. (2011). Climate resilient infrastructure: Preparing for a changing climate. London: Secretary of State for Environment, Food and Rural Affairs by Command of Her Majesty. http://www.defra.gov.uk/publications/files/climate-resilient-infrastructure-full.pdf. Accessed 14 July 2011. EC. (2011). European green cities, winner 2012: Vitoria-Gasteiz. http://ec.europa.eu/environment/europeangreencapital/winning-cities/2012-vitoria-gasteiz/index.html. Accessed 24 Oct 2011. ETCCDI. (2009). CCl/CLIVAR/JCOMM Expert Team (ET) on Climate Change Detection and Indices (ETCCDI). http://cccma.seos.uvic.ca/ETCCDMI/. Accessed 24 Oct 2011. IPCC. (2001). IPCC Third Assessment Report. Climate change: Impacts, adaptation and vulnerability. The Hague: IPCC. http://www.grida.no/publications/other/ipcc_tar/?src=/climate/ipcc_tar/. Accessed 17 June 2011. IPCC. (2011). Agreed reference material for the IPCC Fifth Assessment Report (AR5). http://www.ipcc.ch/pdf/ar5/ar5-outline-compilation.pdf. Accessed 20 June 2011. NRC. (2007). 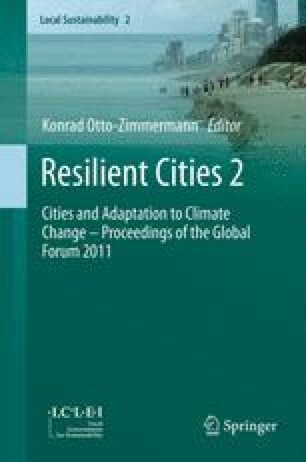 Government roles in climate change adaptation for urban infrastructure. Natural Resources Canada. http://adaptation.nrcan.gc.ca/projdb/pdf/182b_e.pdf. Accessed 12 July 2011. Santa-Coloma, O., Mendizábal, M., & Feliu, E., et al. (2010). Efectos del cambio climático en el País Vasco y estrategias de adaptación. Congreso Nacional del Medio Ambiente, CONAMA10, Madrid. http://www.conama10.es/conama10/download/files/CT%202010/1335416321.pdf. Vitoria-Gasteiz City Council. (2006). Strategy of Vitoria Gasteiz to prevent climate change – Estrategia de Vitoria-Gasteiz para la Prevención del Cambio Climático 2006–2012. http://www.vitoria-gasteiz.org/wb021/http/contenidosEstaticos/adjuntos/5088.pdf. Accessed 15 June 2011.